Oh wow! I don't even have to stop to think about this one...I came across this "the age that I wish to go back to..." at First Love Diary. I thought it was rather interesting and something that I find myself thinking about quite often. For me I wish I could go all the way back to when I was 15 years old. This is the year that it felt like I had lost my mom. We had a small incident that broke the trust that I had for her. I couldn't believe it when she stood there and lied right to my face in front of my father and others just so that my father wouldn't get angry with her. I'm not going to go into all the details but it took away my teen years (so it felt) It was like I had gone from 15 years to adult over night. I didn't know who to turn to or who I could trust anymore. I felt very alone during my teen years with dealing with teenage issues all on my own. I have spoken to my mom about this just recently and we have put it behind us. Although we will never get those years back, at least I feel I can talk to and trust her once again. Requirement: Write about the one age that you wish to go back to and why? 1st -Tag Mode: 5 blogger - You leave their blog and post link and add to the list below. Amidrin wish to go back to age 22 to correct back some mistakes in life. Michelle wish to go back to age 19 to not break off with her First Love. Carrie wish to go back to age 15 to be able to trust my mom again. With my husband just getting home last night and the excitement with the kids welcoming him home we had forgotten all about watching survivor china...we did however manage to catch enough of the end to know that Amanda is still around for another week. This is good for the money pool at his work. Will Amanda make it to the end? Only time will tell! Tune in next week to see if Amanda will continue her quest to the finish or will she find herself sitting at tibal council?! The kids are excited to have an extra day off school this weekend. A nice little break for them but filled with lots of excitement and birthday parties! I am sure they will enjoy their extra time home but will be looking forward to going back on Monday. My husband has gone away on business meetings for a few days and will be back later tomorrow night. I have been keeping busy with the four children and getting myself caught up into more renovating projects...don't worry nothing to complicated just adding an extra bar to hang clothes in our bedroom closet and trying to figure out what to do in the dinning room closet. Things are almost put back together so hopefully Matt won't come home to a mess. Well at least not my mess! I just love Ice Cream! What is your favorite kind and when do you like to have it? I love any kind of ice cream the has peanut butter flavor in it and I usually have it at night after the kids are in bed and I finally have some time to sit and relax! With four kids in the house, oh yes and don't forget my hubby we usually have a good variety of flavors in the freezer! With daddy out of town for a few days at meetings he bought them each their favorite kind of ice cream so when they missed him it was his way of cheering them up! Do you crave Donairs? This is one food that I have enjoyed ever since I was just a young girl...I can still remember my mom making her own donair meat and her homemade donair sauce. Oh how I can taste it right now after all these years. I have never attempted making my own homemade donairs although I now have the recipe and have bought the ingredients to make the meat, I just haven't gotten around to doing it. I think I need some help here from my mom. Maybe her next visit with us we will do some cooking instead of home renovations! But for now my hubby went out to get us donairs. These are pretty good but not the same as my moms! There is something about us and strays animals around here. The other day a stray dog followed me on my walk finally after 45 minutes I lost him in a hardware store. Thank God!Last night a stray cat was meowing at the back door. We did everything we could think of to get it to leave and nope, the cat is still here this morning. I don't know what to do and the meowing is driving us crazy! Since school got back underway, I have been taking advantage of just having the one at home. Most day we walk to meet my hubby at work on his lunch hour, since it take us just over an hour to get there we always get a drive home and Blake gets to enjoy lunch with daddy. So far this week we've walked down to meet him 3 times , the view is so beautiful along the water, the ferry is usually leaving. I'm undecided about today, I will have to make up my mind as we will have to leave in the next 45 minutes. I was thinking of changing our root for todays walk if we go. I thought I would get my husband to meet us at the playpark beside the ferry terminal so that Blake can enjoy the park before it gets to cold. He has been so good on all our walks that this will be a great way to reward him. Not once did he bug me to stop at the park on all our walks. I really love having this time with Blake, he is great company! My husband and our 11 year old son have been butting heads for quite some time. Jay is getting to very difficult and confusing years and it's hard to see that him and his father don't have a very healthy relationship lately. This has been really hard for me to see over the years but nothing I did or suggested would help these two. We have just recently moved and even though it's a lot further from family I feel this was the best move that we have made not only for our family as a whole but for Jay. The kids have adjusted so well and have made lots of new friends and with that said Jay and my husband Matt have become friends themselves. It is so nice to see and Jay is becoming a very responsible young man. I am so proud of him! My husband just recently did a post on his own blog talking about his experience with Jay and how things have changed, I invite you to stop by his site at 1 Males Perspective and check out his very touching post. Tonight was curriculum night at the kids school. This was my first time actually getting a good look through the school. It was a very good night and I had a great talk with Kohl 's(grade primary/kindergarten) teacher. He is making out really well with his first year and lots of work over the next year. The teachers are great which will make the year a lot nicer for everyone. Looking forward to seeing the kids progress through out the year. My 11 year old son Jay brought home a birthday party invitation from a girl "Gabby" in his class. The party will be at the bowling alley on Saturday and he is so excited....it's his first party that he has been invited to for a GIRL! So what do you get and 11 year old girl??? If any one has any suggestions please let me know! He doesn't want to show up with a silly gift that she doesn't want. So as of now I will probably just put money in a card...I'm sure she will be happy with money right?! This afternoon I took the time with my 2 1/2 year old son and we baked some cookies. He had such a great time and he rolled the cookie dough into balls all by himself. He was so proud. So the cookies are baked but unfortunately there aren't any cookies left. Between him and the other 3 kids coming home from school they finished them off. Looks like we will have to bake some more cookies tomorrow! After the excitement of my daughter dancing around the backyard and finding out that she was stung by wasps 5 times, I am glad to tell you all that she is doing fine. Her fingers are a bit swollen and her face and ears look great. She's off to school and ready to tell her friends what happened. I checked out the nest location this morning and there are no signs of any wasps. Hopefully we took care of them once and for all. I am happy to say that with all the fun I am having in the blogging world, I decided it was time to get another blog on the go. Those of you who already know me knows that I always have something to say. I talk and talk a lot. This is a blog where we can share ideas and comments and have fun along the way. 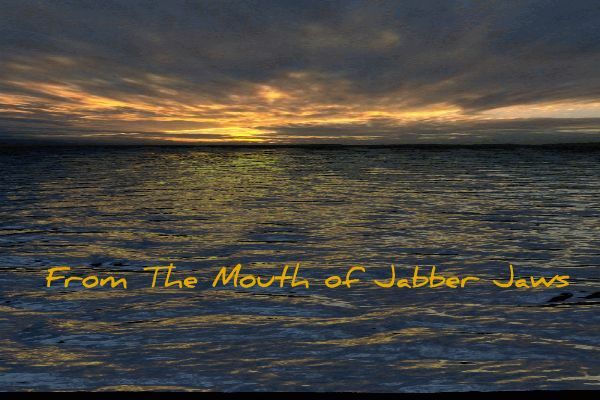 I hope you enjoy this blog and remember to check in to see what "Jabber Jaws" has to say!